Always striving for progress, ADJ pushed the LED Revolution to new heights with its Inno Roll LED and Inno Scan LED fixtures, offering users unique mirrored scanners with huge 50-watt LED sources to power them. Stepping things up another gear, ADJ’s latest Inno Scan Series fixtures – the Inno Scan HP and Inno Roll HP – are even higher-power versions, with both of these big LED scanners bolstered by massively-bright 80-watt LED sources. This is the brightest LED source to ever go into a mirror scanner, making both the Inno Scan HP and Inno Roll HP forward-thinking fixtures in their field. The Inno Scan HP uses this hugely-powerful 80-watt white LED engine and a sharp 16-degree beam angle to deliver incredibly bright shafts of light reflecting from a flat mirror. 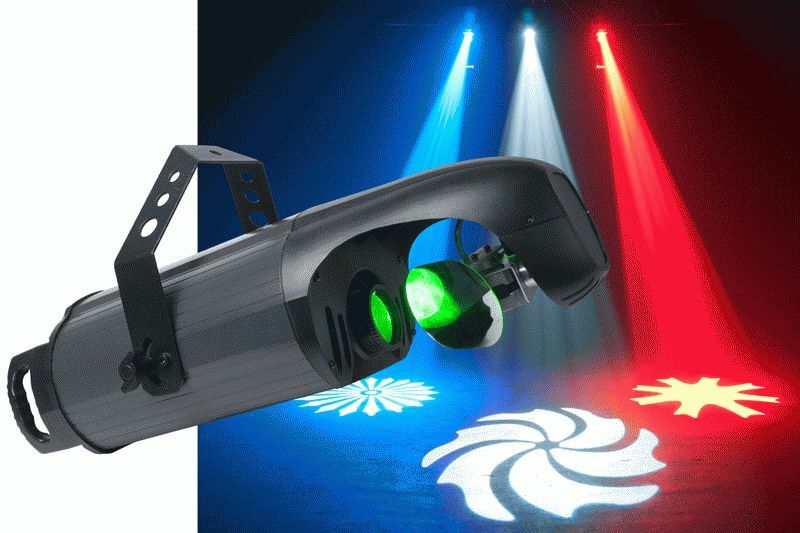 With 8 colors (plus open), the color of the lighting show can be varied and matched to suit any particular occasion, while the 6 rotating, interchangeable GOBOs (plus spot) allow users to project moving patterns or create a spotlight effect. Combining the two, users can effortlessly create mesmeric colored pattern effects with which to generate pure lighting excitement for their audiences. In terms of operation, the Inno Scan HP offers four modes: Auto Run, Sound Active, Master/Slave and DMX. Auto Run and Sound Active modes allow various built-in lightshows to be utilized, creating awesome lighting effects for audiences without users having to deal with the complexities of DMX. Master/Slave and power daisy-chaining capabilities mean that an impressive lightshow using multiple fixtures can be quickly and easily set up, with synchronized movement and impressive effects, but no need for complex programming. However, for those who do want exacting control over their fixtures, DMX-Controlled mode offers a choice of two channel options (8 or 11). In terms of daisy-chaining, the power supply for six units can be linked together at 120-volts, or ten units at 220-volts. The second new fixture in ADJ’s ever-advancing Inno Series is the Inno Roll HP, which – much like the Inno Scan HP – utilizes the power of an 80-watt, high-output, white LED engine but with an amazingly concise 10-degree beam angle, offering users super-bright beams of pure lighting excitement with which to fixate the eyes of their audiences. Being a barrel mirrored scanner, the Inno Roll HP can send its patterns and colors flying across dance-floors and venue walls; it’s also perfect for bringing roller rinks or ice rinks to life, with the fast-moving effects capable of soaring along in the same direction as the skaters. With pulse and strobe effects at hand too, users can up-the-ante when it comes to creating a pulsating party atmosphere for clubbers and dancers. Due to four operational modes, offering both complex and simple options for control, the Inno Roll HP can be operated by a multitude of users. Whether they’re mobile DJs who want a simple but effective lightshow, using Auto Run or Sound Active modes, or lighting designers looking to achieve unique, atmosphere-enhancing results using the 9-channel DMX mode. Meanwhile, Master/Slave capabilities allow users to run the same standalone lightshow across multiple fixtures. Like the Inno Scan HP, the Inno Roll HP is also compatible with the ADJ UC3 Series of remotes, which offer simple control over functions such as blackout and strobe. Again, the power supply for up to six units can be daisy-chained at 120-volts or ten at 220-volts. Both the Inno Scan HP and the Inno Roll HP boast a 50,000 hour lamp life, making the fixtures highly efficient and meaning the lamps will never need replacing – so users can cast aside worries about the lamp blowing during a set or performance. The interchangeable 24mm GOBOs on both fixtures allow users to be selective with their choice of GOBOs; this is great for special occasions and for wedding DJs, where custom GOBOs (of business logos, couples names, etc.) can be incorporated to make an event more personal and memorable. The Inno Scan HP and Inno Roll HP are available worldwide from ADJ USA and ADJ Europe.